"Of course, for every Disney Princess there’s also a Disney Prince, and Eric Kunze is as dashing as they come as “Prince Eric”. First Act declaration, “Her Voice” is introspective and hypnotic—and shows off the brilliant intensity of his own voice, while his solo “On Step Closer” is a sweet courtship through dance, as Eric acknowledges a deeper connection to this unusual—and silent—girl." 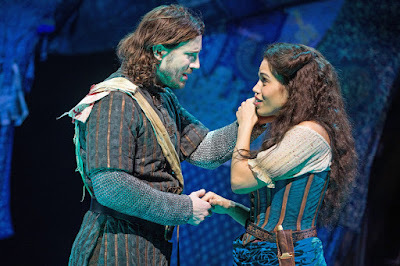 "Kunze has a fine, Broadway musical theater tenor, and his Prince Eric is gracious and pure-hearted." The theater has been packed every night and adults and children exit with smiles on their faces, having been welcomed into a watery fantasy world for 1-1/2 hours. The oohs and aahs start when the curtain goes up to reveal the mermaid Ariel gracefully swimming behind the gauzy scrim. We are excited to see Eric play Phoebus de Martin in Sacramento in August and September 16-October 9th in La Mirada. (See previous post for ticket information). The lowdown: A powerhouse cast has been assembled by director Casale for the season finale. John McGinty, who makes his Music Circus debut as Quasimodo, has played Billy, the deaf member of a dysfunctional speaking family, in “Tribes” with the Guthrie Theater, Everyman Theater and Steppenwolf Theatre Company. McGinty was also in Deaf West Theatre’s production of “Pippin.” The elegant Olivier Award winner Lesli Margherita returns to Music Circus as the gypsy Esmeralda. Margherita was recently on Broadway in “Dames at Sea.” Eric Kunze, last seen here at Broadway Sacramento as the Prince in “The Little Mermaid,” plays Phoebus de Martin. Though based on the 1996 Disney film version of the story, “Hunchback” is darker and closer to the original novel in tone. The creative heavyweights are James Lapine, who wrote the book, with music by Alan Menken and lyrics by Stephen Schwartz. Though highly regarded in Europe, this musical version has had few American runs. The original: Victor Hugo’s French Romantic Gothic novel was published in 1831. Originally titled “Notre Dame Cathedral,” the book was renamed by its English translator, Frederic Shoberl. An ensemble of characters from throughout society inhabit the narrative of this epic and influential work in which the cathedral is a distinct presence.